I was diagnosed with Lyme Disease and am currently in treatment. My goal is to bring awareness about this debilitating disease. According to CDC estimates, new Lyme cases are at least 4 times more common annually than new HIV/AIDS cases. Lyme disease is the leading cause of vector-borne (transmitted by insects) infectious illness in the U.S.
Don't remember a Tick Bite? Fewer than 50% of patients with Lyme disease recall a tick bite. In some studies this number is as low as 15%. 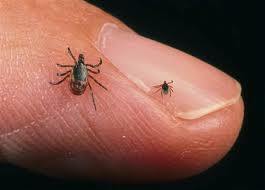 Lyme disease may mimic multiple sclerosis, lupus, rheumatoid arthritis, fibromyalgia, and chronic fatigue syndrome. Flu-like symptoms, fever, aches, fatigue, neck stiffness, memory loss, partial facial paralysis (Bell’s palsy), neurological symptoms. If not caught in time, can become chronic Lyme disease, a debilitating condition which persists despite antibiotic therapy. Protect Your Family. View ILADS Educational Videos to learn more about Lyme disease. If you’d like to find out more about Lyme disease and the usual co-infections, here are some resources that I believe you will find helpful. Watch the movie “Under Our Skin” and the sequel, "Under Our Skin 2: Emergence" on Netflix.